Yes, we understand somehow you have a problem working with online typing jobs, And searching for a way to get typing jobs in offline mode. 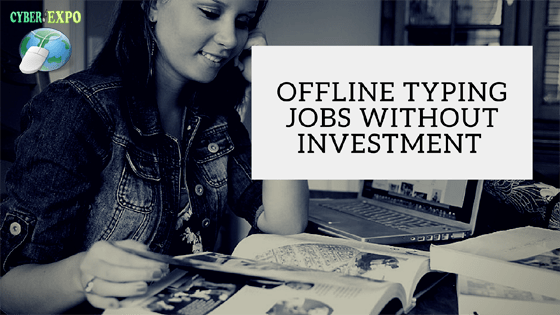 It’s always has been a good idea to get started offline typing jobs without investment! This way CYBER EXPO (Ranked top 10 offline data entry jobs in India) launched India’s first work from home typing jobs that you do at your home without an internet connection. interested in offline work? Let’s get started! Good News! We offer Offline typing jobs without any fees or registration charge. Up to 7000.00 INR weekly payment to your bank account or payTM. Two-way work delivers method: Either you can get work CD or download from Dropbox shared files. Eventually, You can submit your work either through CD mailer or Dropbox shared files. Google OCR in work: HD scanned files for your work. You can zoom up to 500X while working. Still, get paid if you are making any spelling/Grammer Mistake. CYBER EXPO is an ISO 9001:2008 Certified as well as Govt approved online jobs provider in India. You will be Provide a Govt. Agreement Paper with Two Party Signature. Agreement Paper will be Bracketed with Your work validity. Send us an email to info@adpostjob4u.com that you need to verify payment proof and legal documents. We love to share with you. First time in India – CYBER EXPO – Adpostjob4u.com using Google OCR in offline Typing work projects. Due to hard unemployment in India, there is a huge demand for doing offline work from home typing jobs. But finding the genuine type of offline typing is overwhelming. So let’s understand India’s top 6 type of offline typing jobs without investment and registration fees. 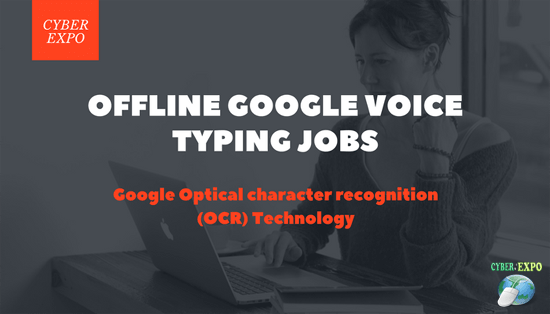 A. Google voice typing jobs. B. offline book typing jobs. C. offline image to document typing project. D. offline excel to Ms word report typing jobs. E. Offline Excel Books of account creating Jobs. Technology what make you earn more! Do you know why most of the offline typing jobs failed? It’s because of the low quality of scanned date to work. See if you want to make money doing offline typing in any company, then you must achieve 99% accuracy rates. On the other hand, poor text matter quality will kill your visibility and finally your fields. So, As a solution in CYBER EXPO instead of using a regular scanner, we used Google Optical character recognition (OCR) from the cloud platform. This will give our member a high-quality image to work that can be zoom up to 500X. If you don’t want to see the video, then keep reading on to know how to start? First of all, you have to download or order offline typing jobs CD from CYBER EXPO member area. Now unzip the files into the local driver. Next, You have to use either MS Word or notepad to type. Remember, each text matter should be typed in separate text files or MS doc files. Note: You can work anytime anywhere without any internet connection. More video tutorial and PDF instruction will be available in your member area. How we make payment to our member? All the payment will be paid through RTGS/ NEFT. member without any bank account can take their payment over PayPal or Payoneer. Since its take 2-3 day to send and receive work through file sharing media we offer only weekly payment. How to make money doing offline typing? Offline typing jobs are one of best legitimate work from home jobs with no startup. There are several ways to earn money doing this jobs in CYBER EXPO. Be an individual member of type N and earn program. Do you have any BPO? Want to grow your small business? Let’s start by sing into our offline typing jobs franchisee partner and earn huge profit weekly. How to register for our Free offline Typing jobs? First of all, choose the best plans (No worries, All plans are free) from the plan pricing tag. Now, you will be redirected to the application form page, over here you supposed to fill the information. Note: College students and housewife can apply directly by sing into CYBER EXPO Prime membership account for Free. Now you will receive an email notification, there will be two simple steps that you supposed to complete within next 3 business day. That’s it, Now wait for 7-10 days (for College students, and housewife it will be 2-3 days). Once you receive your member area username and password you are ready to get started the work. All your earned money will be visualized to your member area under my account. Any information can be updated at any time from your member area. Doing offline typing jobs from home without investment is so easy and has a very basic requirement. Any Windows PC with minimum 1 GB RAM. Microsoft office 2007 or higher for MS word typing jobs. For Google voice typing offline work, you can use dictation.io free tools on chrome browser. 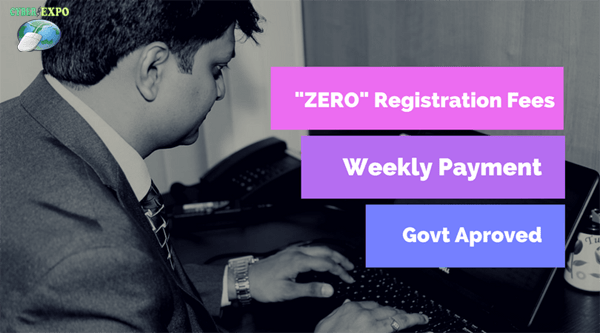 Who are eligible for our offline typing jobs from home without investment and registration fees? There is a huge demand for home-based offline typing jobs in India! But we have limitations. Forgetting offline typing work in CYBER EXPO, You must have an India citizen. Only adult people can apply here. We have priority for the college students and housewife. Since we received more application than actual vacancy we may cancel few of the application that not look real. Before your sing up to any CYBER EXPO-adpostjob4u.com free online jobs, you must read our term of service and agree with them. If you if are not likely/friendly/disagree with any of our TOS please avoid subscribing to our free online jobs.